The stone arch bridge in Hillsborough, NH was the subject of a blistering stump speech by presidential candidate Mitt Romney, who asked how $180,000 of stimulus money was spent on a bridge that connects to no road and carries no traffic. Bridge, in the news, in driving range -- I headed right up to get a look for myself at this "bridge to nowhere". It's a nice enough bridge. Recently maintained, with a railing around it so you can walk around on top of it without falling into the Contoocook River, which it crosses. The Hillsborough folks say they were thinking of building a park around it, but it's certainly not in the center of anywhere. double-arched Sawyer Bridge, in 1866. I'm wondering where the other four surviving stone bridges are... 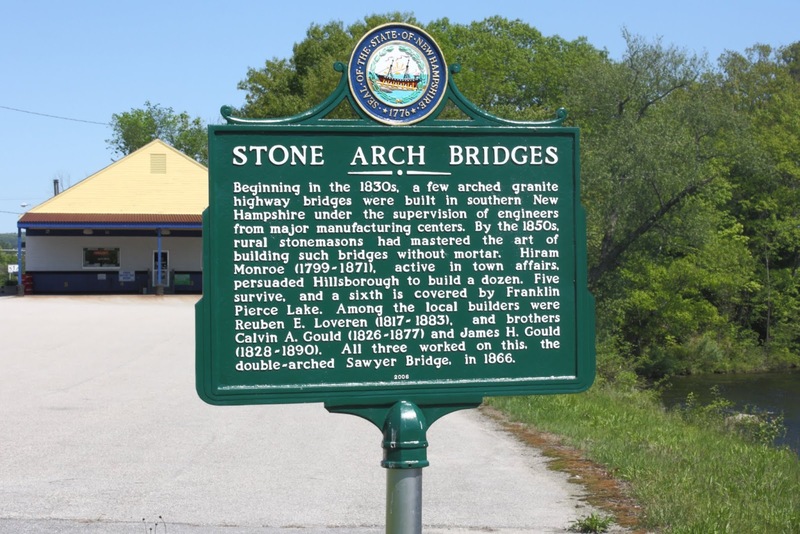 It's interesting that the sign mentions that stonemasons had mastered the art of building stone bridges without mortar, while the Sawyer Bridge clearly uses a ton of mortar. Perhaps that was put in during the renovation. According to Gilman Shattuck, historic bridges like the Sawyer Bridge are important reminders of our past. Mr. Shattuck, a former member of the New Hampshire House of Representatives and a Democrat, also happened to be a contributor to a book of historical images of city. He wrote the chapter on bridges. 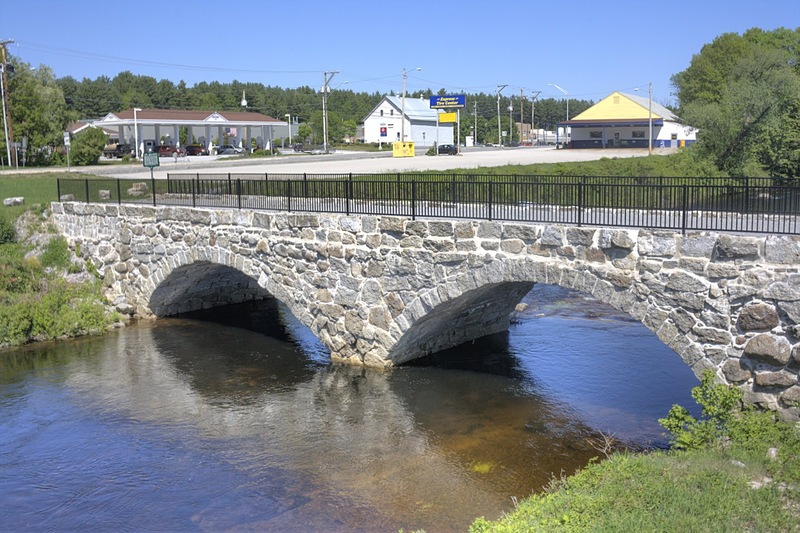 Sites like the Sawyer Bridge, he said, are important history landmarks that help out with the New Hampshire tourism industry. “We’re talking sofa money, sofa change money,” Mr. Shattuck said of the stimulus dollars funneled to the bridge. According to the Associated Press, the total amount of stimulus funding used to repair the bridge was $150,000. Parking is pretty much anywhere. There are parking lots surrounding it. Not sure it's worth a special trip; I fit in five covered bridges and a trip to the New Hampshire seacoast along the way and that made it worthwhile to me. I guess someone got the GPS coordinates wrong, or plans were scrapped at some point to do something with this place. Wonder if people who build it thought, wha? I imagine there was once a road leading over it (it's almost 150 years old). A replacement bridge was built right next to it, and that's the one that now carries traffic. It's clearly a historic bridge, though I don't think it needed such extensive renovation if it weren't going to be used for anything. It looks brand new right now, which kind of misses the point (to me) of the living history angle. They should run a road over it. The replacement bridge is a more modern arch bridge clearly intended to echo the Sawyer Bridge. Re-reading the sign, I can see that at some point in the future (far future), I'm going to need to hunt up all the surviving stone bridges in Hillsborough. It's only half an hour from Concord, and I need to go up there to tend the graves of my parents at some point. I'll try to do it then. When I started this blog, I expected to run out of bridges pretty quickly, but instead I keep finding more and more. The Sawyer Bridge which is also known as the "Bridge to Nowhere"" was built in 1866 by Rueben Loverin. I’ve also read his speech, by the way/ Well, whether building the park was a waste of stimulus money or not, one thing's for sure: Arguing over "park" was quite unnecessary. They should’ve focused more on the other bridges that need to be renovated.